Central retinal artery occlusion (CRAO) is an ophthalmological emergency and it is analogous to an acute stroke of the eye. The incidence is 1 in 100 000 people.1 It is characterised by a sudden, unilateral and painless loss of vision. Embolism is the most common cause of CRAO, the major source of which being carotid artery disease. The natural history of CRAO is the reperfusion of the artery over a few days. Meaningful improvement (15 ETDRS (Early Treatment Diabetic Retinopathy Study) letters or three lines in Snellen chart) occurs only in 10% of the patients with spontaneous reperfusion. We present two patients with CRAO who were submitted to HBOT. It is important to recognise that this treatment could be a good option if it is started earlier. Case 1: a 61-year-old woman patient presented to the emergency room with sudden loss of vision in the left eye (OS), which started 4 hours before the admission. Her past medical history included hypertension and type 2 diabetes mellitus. Her BCVA(Best corrected visual acuity) was CF OS and 1.0 OD(right eye), on a decimal scale. A relative afferent pupillary defect (RAPD) was present OS. Biomicroscopy of both eyes was normal. Intraocular pressure was normal in both eyes. Dilated fundus examination of the left eye showed an area of retinal whitening with redness in the foveal area. The right eye was normal. 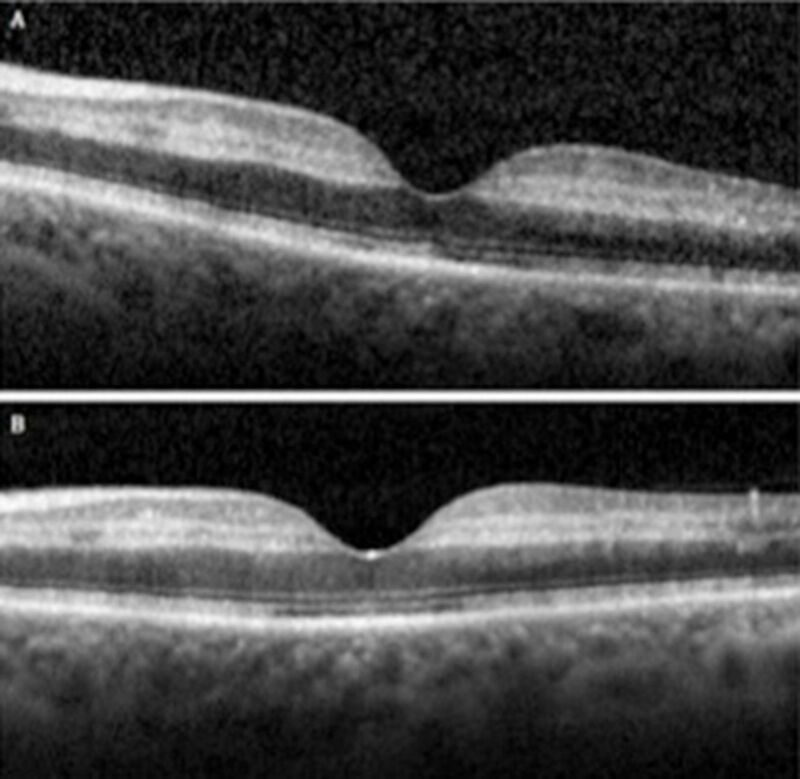 Spectral Domain Optical coherence tomography (SD-OCT) revealed increase in thickness and reflectivity of the inner retinal layers, consistent with intracellular oedema (figure 1A). Fluorescein angiography (FA) showed a delay on the filling phase of the central retinal artery (figure 2). The first Spectral Domain Optical Coherence Tomography (SD-OCT) (A) revealed an increase in thickness and reflectivity of the inner retinal layers. The outer retinal layers are normal. The SD-OCT (B) performed 9 days after the diagnosis showed a normalisation of the inner retinal thickness. The first fluorescein angiography showed a non-perfusion (delay for more than 3 min) of the central retinal artery, with near normal choroidal perfusion. Case 2: a 69-year-old Caucasian man presented to the emergency room with sudden loss of vision in the left eye, started 2.5 hours before admission. Past medical history was significant for arterial hypertension and type 2 diabetes mellitus. BCVA was CF with positive RAPD OD and 1.0 OD. The anterior segment examination, intraocular pressure and fundus examination were normal in both eyes. FA of the left eye demonstrated delayed filling of the central retinal artery. OCT showed increase in thickness and reflectivity of the inner retinal layers, consistent with intracellular oedema. Case 1: the patient was referred to the Hyperbaric Medical Unit of Hospital Pedro Hispano, and was submitted to the first session of hyperbaric treatment at 2.4 ATA (atmosphere absolute) oxygen (100%), during 90 min, in a gas chamber. The first session was done 6 hours after the onset of symptoms. She was submitted to two additional daily sessions of 90 min, on each one of the next 3 days, and one additional session on the fifth day. Case 2: ocular massage was performed and topical antihypertensive medication was prescribed. Immediate referral to the HBO centre was undertaken. The first HBOT session was preformed 4 hours after the onset of the symptoms, in a gas chamber of the Hyperbaric Medical Unit of Hospital Pedro Hispano, at 2.4 ATA oxygen (100%). Two additional daily sessions (90 min) were prescribed in the next 2 days, followed by only one daily session for the next 5 days. Case 1: patient was checked for any other disease which could cause vascular occlusion, and we found a value of 8.8% for HbA1c in laboratory tests, and the presence of ventricular extrasystoles on Holter (figure 3). Twenty-hour Holter showed ventricular extrasystoles with ultrashort coupling interval (260 ms) and a non-sustained polymorphic ventricular tachycardia initiated by extrasystoles with short coupling interval. Three days after starting HBOT, BCVA OS improved to 1.0. Seven weeks after the initial visit, FA was repeated and showed normal fluorescein filling of the central retinal artery (figure 4). OCT was done in each one of the 3 days after the diagnosis, and was repeated after the 9th and 37th days (figure 1B). The thickness of the inner retina started to reduce on the third day after the diagnosis, and stabilised since the ninth day. The second fluorescein angiography (after 7 weeks) revealed a normal fluorescein filling of the central retinal artery arterioles and capillaries, started at 18 s. There is no retinal or macular ischaemia. Case 2: patient was checked for any other disease which could cause vascular occlusion, laboratory examination showed hyperglycaemia and hyperkalaemia. The carotid echo-Doppler demonstrated atheromatous carotid disease, without significant dynamic repercussion, and echochardiogram found an enlargement of left auricle and hypertrophy of left ventricle, with mild aortic insufficiency. Thirteen days after the initiation of therapy, the visual acuity of the left eye improved to 0.8. Ten days after the initial visit, control FA showed improvement in fluorescein filling of the central retinal artery (time arm-retina, 23 s). OCT was done in each one of the 3 days after the symptoms, 1 and 2 months after. The thickness of inner retina started to reduce in the 10th day and stabilised on the 14th day. In the clinical setting of CRAO, however, some residual retinal blood flow has been detected by angiography. This may help explain the variability in visual outcome with different time delays until treatment. Literature suggests that HBOT can also reduce macular oedema.5 The thickness of the inner retinal layers of our patients showed a progressive reduction, comparing with their fellow eyes, consistent with the reduction of the oedema. Many studies have reported that HBOT is useful in the treatment of CRAO,5–12 but that are different opinions about the period of time when HBOT can be useful. Butler et al 11 reported that the best evidence is a delay of <12 hours. Hertzog et al 12 and Beiran et al 8 described that HBOT is most useful when started within 8 hours of onset visual loss. Our patients responded to the HBOT treatment well. The improvement may be related to the early timing of the treatment of our patients (6 hours) and the absence of other ophthalmological problem or precipitating factor. Hyperbaric oxygen therapy (HBOT) seems to be an option for the treatment of central retinal artery occlusion (CRAO) that can be easily administrated. HBOT produce an improvement in vision if it is done in the first 24 hours after the onset of the symptoms. Further studies with more patients are necessary to determine the value and safety of this therapy in the treatment of CRAO, as well as the exact time window to perform HBOT.
. The Hyperbaric Oxygen Therapy Committee Report. Central Retinal Artery Occlusion. Gesell LB , editor. Hyperbaric oxygen therapy indications. 12th edn. Durham, NC: Undersea and Hyperbaric Medical Society, 2008:57–66.
. Retinal artery occlusion: visual outcome after treatment with hyperbaric oxygen. Diving Hyperb Med Journal 2011;41:135–9.
. Central retinal artery occlusion treated with oxygen: a literature review and treatment algorithm. Undersea Hyperb Med 2012;39:943–53.
. Hyperbaric oxygen treatment of nonacute central retinal artery occlusion. Undersea Hyperb Med 2009;36:401–5.
. Early hyperbaric oxygen therapy for retinal artery occlusion. Eur J Ophthalmol 2011;11:345–50.
. [Hyperbaric oxygen therapy in retinal artery occlusion]. Ophthalmologe 2000;97:461–7.
. Hyperbaric oxygen therapy and the eye. Undersea Hyperb Med 2008;35:333–85.
. Central retinal artery occlusion, treated with hyperbaric oxygen. J Hyperbaric Medicine 1992;7:3–42.
. Clinical case report: treatment of a central retinal vein occlusion with hyperbaric oxygen. Undersea Hyperb Med 2007;34:315–9.